Scott Boden struck a disputed late winner for Newport County as Mansfield Town slipped out of the League Two play-off places in this 1-0 defeat. On a poor Rodney Parade pitch, both sides failed to play their best football as the game looked to be heading for a draw. But with four minutes left Boden fired home his 13th of the season, despite calls for offside, to lift relegation-threatened Newport to 19th, while the Stags slipped down to ninth. 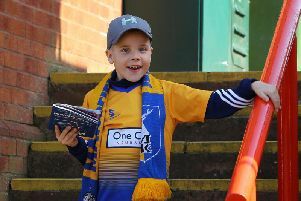 Mansfield manager Adam Murray made three changes to his starting XI, with Krystian Pearce suspended after his red card last week and Adam Chapman and Chris Beardsley dropping to the bench. In came Jamie McGuire, James Baxendale and Colin Daniel, the latter rejoining the club on loan from Port Vale until the end of the season. The ground staff at Rodney Parade laid 40 tons of sand onto the surface last week after heavy rain had turned it into a mud-bath. After Scott Shearer had saved superbly from Conor Wilkinson early on, the Mansfield defence could have pulled out the deck chairs as the visitors dominated proceedings. Chris Clements was convinced he should have had a penalty for a push in the back but referee Gavin Ward was unconvinced. Matt Green then nearly opened the scoring against his former club as he took advantage of some sloppy play from Medy Elito on the edge of the area. The striker’s powerful shot beat home goalkeeper Joe Day but cannoned back off the post to safety. Defender Ryan Tafazolli headed in soon after the restart but his goal was ruled out by the offside flag. That man Clements surged through the middle again and found space but his drive from the edge of the box was always rising and cleared Day’s bar by a foot. At the other end Collins cleared off the line from Elito and substitute Yan Klukowski almost poked home a winner. But that honour went to Boden who fired home after a Darren Jones shot was deflected into his path, with Stags claims that the striker was offside falling on deaf ears, Shearer going into the book for his protestations while Daniel Alfei and Boden were also both carded following a shoving match. NEWPORT: Day, Holmes, Barrow (Klukowski 66), Jones, Davies, Elito, Wilkinson (Morgan 82), Hughes, Ayina, Boden, Byrne. Subs not used: Green, Donacien, Owen-Evans, Parselle, Meechan. STAGS: Shearer, Alfei, Collins, Tafazolli, Benning, McGuire, Clements, Blair (Rose 68), Daniel (Kavanagh 72), Baxendale (Yussuf 56), Green. Subs not used: Jensen, Thomas, Beardsley, Chapman. REFEREE: Gavin Ward of Surrey.